For some reason, a lot of runners (and other athletes) tend to overcomplicate nutrition. For something that should be really easy, we tend to make it really hard. Calories (1 Calorie = 1kcal = 1000 calories) come from three major sources: carbohydrates (4kcal per 1g carbs), proteins (4kcal per 1g protein), and fats (9kcal per 1g fat). There's also alcohol, but for purposes of this review, I'm going to ignore that. Exactly how you're supposed to balance this seems to be up for debate, with recommendations ranging from the 40:30:30 Zone Diet to the 60:10:30 supposedly balanced diet to the 75:10:15 high carb diet to a million other carb:protein:fat ratios. I'm not going to even touch macronutrient ratios, seeing as I'm not a nutritionist, other than saying that I personally perform best off a high carb, low fat diet, but your mileage may vary. Just wanted to give a little background information for anyone who needed it. Anyway, I find that when I'm training hard (which is often), my cravings are very carbohydrate focused. Considering carbs are your main source of energy, this is mostly good. However, I've found that a little bit of protein mixed with my carbs helps tremendously with my recovery, particularly immediately post-workout, in that 20 minute glycogen restoration window. 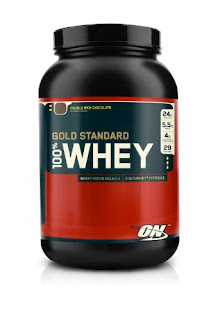 Enter Optimum Nutrition Gold Standard 100% Whey. While it might be ideal to get your protein from a normal food source, I find using protein powder really convenient. Like most animal proteins, whey is a complete protein, meaning it includes all of the essential amino acids. Whey is a good source of branched chain amino acids (BCAAs), making it an ideal protein for stimulating protein synthesis in muscles because a large amount of it is assimilated. Whey is supposedly a quickly processed form of protein, making it great for recovery. Gold Standard Whey is a combination of whey isolate and concentrate. Whether it's better to go pure isolate (lowest fat and lactose, higher price), pure concentrate (higher levels of bioactive compounds, lower price), or a mixture of both seems to be up in the air, though it does seem that at the moment, most experts are pointing to a combination. For what it's worth, I've used all three kinds and didn't notice any difference in recovery. Gold Standard Whey is pretty easy to mix. 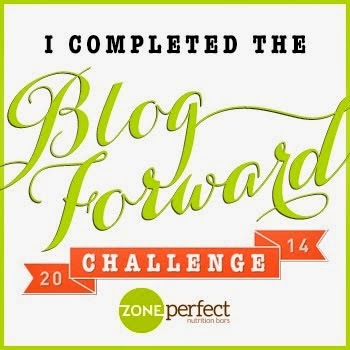 When blended into a smoothie, it blends into a smooth texture with no noticeable lumps. It also stirs very well into oatmeal. While it can also be added to milk, the spoon + milk in a glass method can sometimes leave lumps, though a shaker cup does a pretty good job with blending. I almost never use an entire scoop of whey though (I usually use 1/3 of a scoop for 1.5 cups of oatmeal and 1/2-3/4 of a scoop for smoothies and for milk, both of which I can usually fit in a pint glass), which probably helps with dissolving. The actual instructions say to mix one scoop with 6-8 ounces of water or milk, but first of all, I hate mixing protein powder with water because it always tastes like crap, and second, that seems like a lot of powder for not much liquid. Additionally, I generally prefer mixing it with either oatmeal or into a fruit smoothie rather than just with milk, since I feel that taking in a combination of protein and carbs, rather than mainly protein, optimizes recovery even further. Gold Standard Whey comes in a variety of flavors. I am currently using Cookies and Cream. I actually think it's really tasty. I'm not sure it actually tastes like cookies and cream, but I really like it anyway. Then again, I can eat Powerbars as candy and am convinced they taste just as good as Hershey's bars (seriously! ), so you may want to take my taste recommendations with a grain of salt. The nutrition facts and ingredients vary slightly with each flavor (nothing drastic though). The cookies and cream flavor does include high fructose corn syrup if you're worried about that, but it also only has 1g of sugar per serving (which is a huge scoop), so it's really a very small, minute amount. It also uses sucralose as a sweetener, something to be aware of if you're sensitive to artificial sweeteners. Additionally, Gold Standard Whey includes milk, soy, and wheat ingredients for those with allergies. Right now, Gold Standard Whey is my whey protein of choice. It tastes good, dissolves well, is pretty economical for whey protein, and gets the job done. Each (30.4g) serving of Gold Standard Whey Cookies and Cream provides 130 Calories, 1g fat (0.5g saturated fat), 4g carbohydrate (1g sugar), and 24g of protein. There are also 30mg cholesterol, 190mg sodium, and 10% of your daily requirement of calcium. Ingredients for Gold Standard Whey Cookies and Cream include: Protein Blend (Whey Protein Isolate, Whey Protein Concentrate, Whey Peptides), Natural and Artificial Flavors, Cookie Crumbs (Enriched Flour [Wheat Flour, Niacin, Reduced Iron, Thaimine Mononitrate, Riboflavin, Folid Acid], Sugar, Palm and Palm Kernel Oil, Cocoa [Processed with Alkali], High Fructose Corn Syrup, Corn Flour, Salt, Dextrose, Sodium Bicarbonate, Soya Lecithin), Salt, Gum Blend (Cellulose Gum, Xanthan Gum, Carageenan), Lecithin, Sucralose, Aminogen, Lactase. Optimum Nutrition Gold Standard 100% Whey is available at a variety of retailers. I bought a 2lb container at GNC for $29.99 because I had a coupon, but you may be able to find it cheaper if you look around. Full disclosure: Nothing to disclose. I bought this myself. I have been using this product for about 2 years now and it has helped me make great changes in my body type. The taste is better then any protein I have tried and it is mostly chemical free which I also enjoy. I would recommend this to anyone who is weary about taking supplements due to the nature of this product.